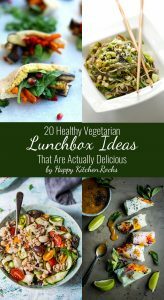 20 Delicious and Healthy Vegetarian Lunchbox Ideas that are everything but boring: Satisfying, quick and easy lunch recipes to look forward to! Easily portable, mess-free, packed with nutrients, can be eaten cold. I know that many of you are struggling with how to eat healthy and vegetarian while eating outside. I can absolutely relate to your struggles with this issue. The best tip here is: Think ahead. Sure you can have lunch with your colleagues at a restaurant. But not every restaurant has healthy vegetarian options and even if it does, you gotta have lunch every day, so repetitive meals become boring pretty quickly. Not to mention it can be expensive. 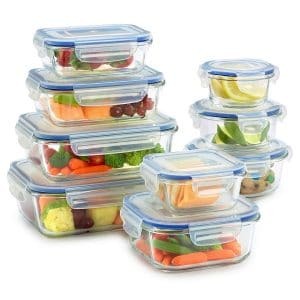 On the other hand, lunch can be challenging to make ahead, since you are limited to easily portable meals that have to be nutritious and not boring. Bonus point if they can be eaten cold. Two bonus points if they are delicious. 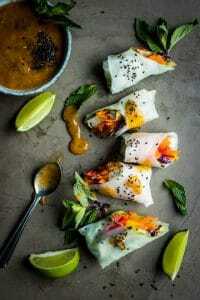 I have a few healthy vegetarian lunchbox ideas that are everything but boring from some of my favorite food bloggers. And they are delicious too! There are quite a few vegan and gluten free recipes here as well. No more brainstorming in the supermarket or making the same old boring sandwiches over and over again. easily portable in a lunchbox. 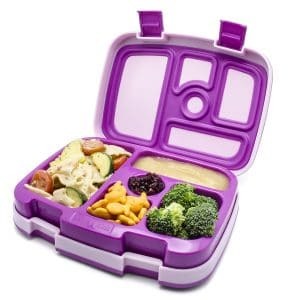 Back to the healthy vegetarian lunchbox ideas. I have quite a few vegetarian lunch recipes on my blog that I can swear by. 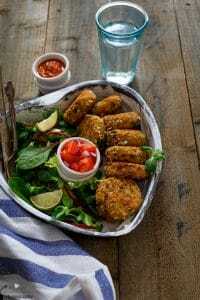 Check more amazing vegetarian lunch recipes by my fellow food blogger friends below. 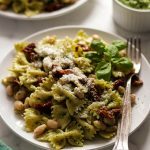 This creamy, delicious, healthy, satisfying vegan pesto pasta is the perfect marriage of comfort food and culinary art that comes together quickly and simply. Celebrate springtime with this delicious and healthy asparagus quiche with sweet potato crust. This easy quiche is made of 7 ingredients and is perfect for brunch, Easter or any springtime family gathering! This easy Greek Orzo Salad is perfect for picnics, potlucks, BBQ and get togethers. 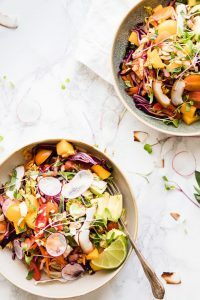 Whenever you need an easy and healthy side dish, that is guaranteed to disappear first, make this gorgeous Greek orzo salad! Easy and delicious Vegan Roasted Carrot Soup with lentils and Moroccan spices. This velvety, rich and healthy carrot soup has a perfectly balanced flavor! Easy and delicious Turkish Boerek with Spinach and Feta Cheese is great for takeout lunch or vegetarian dinner. It takes 20 minutes (+ 25 minutes baking time) and 7 ingredients to prepare it! These gorgeous looking Mediterranean pinwheals only take 6 minutes to make! 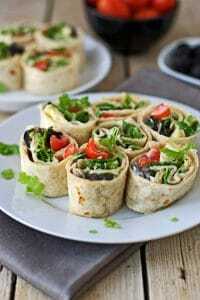 Veggies and olives with tangy tahini sauce rolled up in a crispy tortilla… Quick and delicious lunch full of flavor and veggie goodness! 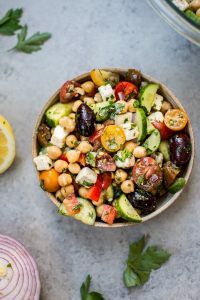 This Mediterranean chickpea salad has all the flavors of a classic Greek salad plus hearty chickpeas and fresh oregano and parsley for an extra pop of flavor. A wonderful light meal or side dish! Loaded with crunchy veggies and creamy avocado on a bed of silky Asian noodles with a spicy lime honey dressing. You need this noodle salad in your life. 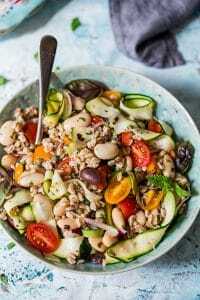 Shake up your lunch routine with this delicious Farro Salad!! 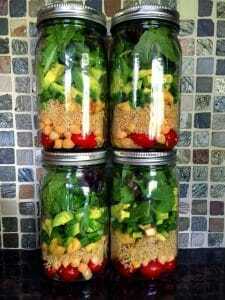 This amazing chickpea quinoa mason jar salad is so fresh, healthy, filling and delicious! That’s a lunch to look forward to! 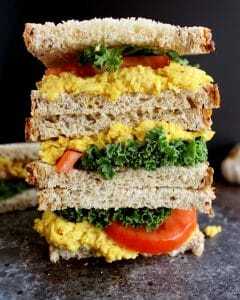 Looking for an easy vegan sandwich recipe? Try this turmeric chickpea salad! It’s a plant-based alternative to a tuna salad or egg salad sandwich – and full of protein and flavor! Add your favorite sandwich toppings and devour. 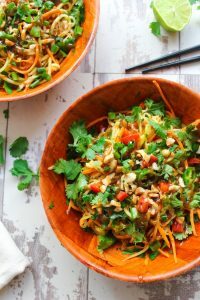 Veggie Pad Thai Salad with a sweet and savoury peanut dressing – ready in 15 minutes or less. 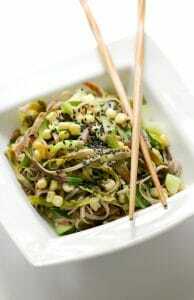 This spicy noodle bowl uses julienned zucchini in place of noodles making it perfect as light lunch or dinner side. I have been hunting for lunch ideas to bring to work. Cannot wait to try these!! Especially the pad thai zoodles! Yum! I’m so happy the post is useful for you Kortney! 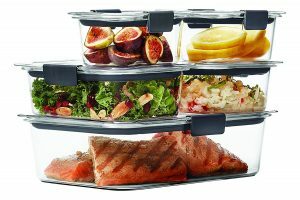 Please let me know which lunchbox recipes you like the best 🙂 Cheers! I’m so glad it was helpful for you Catherine! There are so many fresh, colorful options here! They look fantastic! Thank you Ashley! Love all the recipes too!